Writing in the journal Current Biology, ecologists suggest these birds – and others – may sense such extreme events with their keen low-frequency hearing. Remarkably, the warblers had completed their seasonal migration just days earlier, settling down to nest after a 5,000km (3,100 mile) journey from Colombia. Dr Henry Streby, from the University of California, Berkeley, said he initially set out to see if tracking the warblers was even possible. “This was just a pilot season for a larger study that we’re about to start,” Dr Streby told the BBC. “These are very tiny songbirds – they weigh about nine grams. Working with colleagues from the Universities of Tennessee and Minnesota, Dr Streby tagged 20 golden-winged warblers in May 2013, in the Cumberland Mountains of north-eastern Tennessee. The birds nest and breed in this region every summer, and can be spotted around the Great Lakes and the Appalachian Mountains. After disappearing to Colombia for the winter, 10 of the tagged warblers returned in April 2014. The team was in the field observing them when they received advance warning of the tornadoes. “We evacuated ourselves to the waffle house in Caryville, Tennessee, for the one day that the storm was really bad,” Dr Streby said. Elsewhere in the US the storm had more drastic consequences. 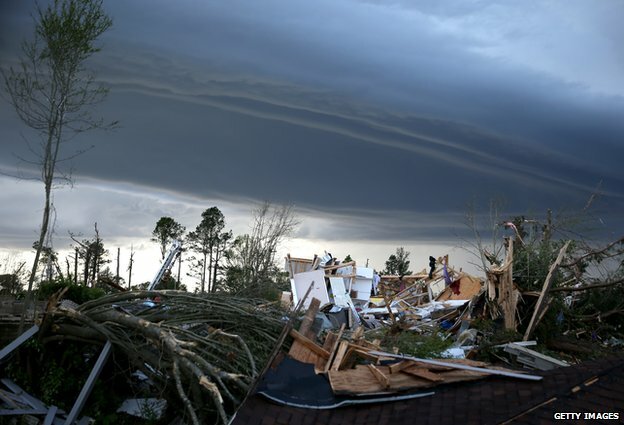 At least 84 tornadoes caused 35 fatalities and more than $1bn (£0.6bn) in property damage. After the storm had blown over, the team recaptured five of the warblers and removed the geolocators. These are tiny devices weighing about half a gram, which measure light levels. Based on the timing and length of the days they record, these gadgets allow scientists to calculate and track the approximate location of migratory birds. In this case, all five indicated that the birds had taken unprecedented evasive action, beginning one to two days ahead of the storm’s arrival. “The warblers in our study flew at least 1,500km (932 miles) in total,” Dr Streby said. They escaped just south of the tornadoes’ path – and then went straight home again. By 2 May, all five were back in their nesting area. Remarkably, the warblers’ evacuation commenced while the closest tornado was still hundreds of miles away. Weather conditions in the nesting area were still nothing out of the ordinary. The most likely tip-off was the deep rumble that tornadoes produce, well below what humans can hear. Noise in this “infrasound” range travels thousands of kilometres, and may serve as something of an early warning system for animals that can pick it up. “It’s very unlikely that this species is the only group doing this,” Dr Streby said. Dr Chris Hewson, a senior research ecologist at the British Trust for Ornithology, told BBC News that infrasound was a plausible explanation. He pointed out that several birds, including falcons, are thought to use infrasound to help them navigate. “And you can see from the weather data that there doesn’t appear to be any alternative cue that they could be picking up on,” he said. The new study is the first time that migratory birds have been seen taking such dramatic evasive action. Dr Hewson agreed the finding was “an eye opener”. “It’s the sort of thing that we’re going to see more of in the future as well, as tracking devices get more miniaturised,” he said. He also cautioned, however, that because the birds’ locations were calculated from light readings rather than using satellite tracking, they should be interpreted with caution. Changes in the weather or other factors shading the geolocators can interfere with those calculations. But the study’s authors said the changes in day length recorded by the geolocators were smooth, suggesting they did indeed reflect migration rather than shading errors. The sheer size of the calculated movement, from all five birds under observation, also indicates a real “evacuation”, Dr Streby said. “In cloudy or stormy weather, those estimates can be off by a couple of hundred kilometres. But our worst estimate during any cloudy day was nowhere near as far off as these movements were.